DUFOUR - Allemagne . . .
DUFOUR, A.H. - Allemagne . . .
Allemagne . . . - DUFOUR, A.H. Title : Allemagne . . .. Date : Paris, A.H. Basset, 1828. Size : 13.6 x 16.3 inches. / 34.5 x 41.5 cm. Colouring : In attractive original o/l colours. 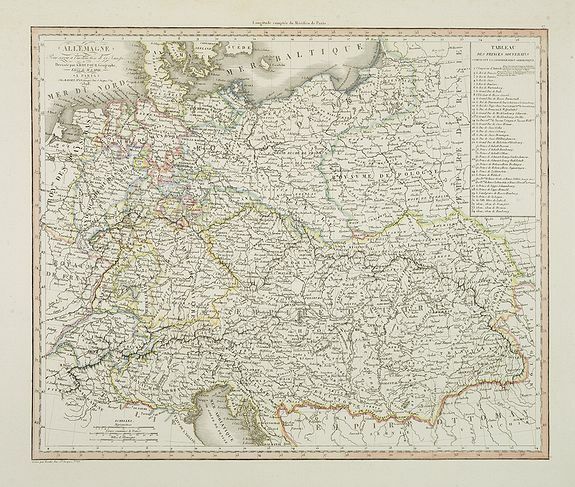 Description :Detailed map of Germany and Austria, prepared by A. H. Basset, rue Saint-Jacques, no. 64, Paris and published in Atlas classique et Universel de Géographie . . . . The engraver of the map was Berthe. Condition : Steel engraving, in very good condition.